Travelling with kids is really enjoyable and it helps to strengthen the relationship with the family members. Almost all parents want to travel with their children. However, making a comfortable journey with kids may not be always possible because of a lot of reasons. You should do a lot of homework and preparations before travelling with your children. 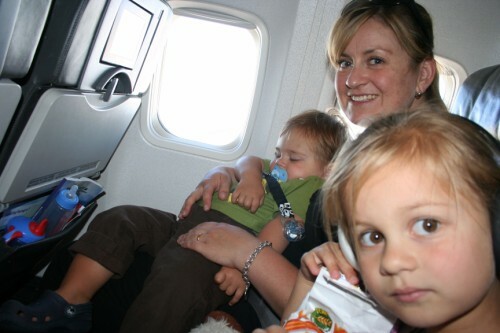 This article, Travel with Kids, will keep you and your toddler-smiley Happy. Toddlers love comfy seats: It helps if you ensure that your baby is comfortably seated. Toddler’s Milk: While it can be embarrassing breast feeding your toddler while being on-board, it’s advisable to keep Milk Bottle ready while boarding your flight. Keep Busy: Always keep your toddler occupied. Give him toys, etc. Diaper issues- always the culprit: Make sure you have extra pair of diapers ready whenever you travel with kids. Baby wipes-such a handy tool to make your life easy when you travel with kids or infants. Avoid the Rush: Always plan your journey well before departure date. Keeping Log: Prepare a list of needs for each family member; especially when traveling with Kids. Avoid laces, zippers & use slip-ons. All children habitually visit bathroom in a hurry. Hence, anything preventing them (zippers, shoe laces) from getting inside the bathroom can be messy and embarrassing for you!!! Armed with Snacks: Kids are always hungry. Always satiate their appetite to avoid witnessing their tantrums and turning your journey into a nightmare. First Aid: Never forget the first aid box & medicines for your family. Away from aisle: Never forget to seat your Kid away from aisle. Kids reaching out the moving cart with hot coffee, water would be a cause of emergency. Temperature Blues: Experienced flight attendants can be quoted advising to be prepared for the varying temperature and climate while in flight and on reaching your destination. Don’t forget to make your children wear suitable layers to avoid catching a cold or fever. Keeping vigil: Remember to keep an eye on your children. Kids are full of curiosity and love to explore the places. Nowadays locator app lets you do the tracking without breaking sweat!!! Stay Connected: Don’t forget this! Always travel with a mobile phone or tablet and also carry a power bank to ensure you stay connected and updated just in case you need someone’s assistance. Babies are very delicate. More so, whenever you travel with kids, they need special care in seating department. Nowadays special Travel baby seats are available at cheap prices in the form of portable and inflatable seats which are simple to use. These baby seats prevent your baby from getting rashes on bums and legs during long hours of flight. Travel Baby seats not only keep your baby happy but also prevents leakage of diapers in case it’s full. Travelling can be really an eye-opening and enlightening experience for kids of all ages. It is the best opportunity for getting new sights, experiences, and food and also a quality family time. However, travel with kids can also be overwhelming. If you implement the above mentioned tips in your travel, you can make a wonderful journey with your kids.